The American diet is changing—for the better—as more and more Americans are opting to go vegetarian at least a few times a week. Meatless Mondays, a nonprofit initiative launched in association with Johns Hopkins School of Public Health in 2003 to reduce meat consumption to improve personal health and the health of the planet, has attracted a growing fan base. It has garnered the support of dozens of universities and restaurants, entire cities (San Francisco, CA, and Ghent, Belgium), and celebrities, including Mario Batali, Al Gore, and Gwyneth Paltrow. EatingWell Fast&Flavorful Meatless Meals reports on the latest science, which shows that eliminating meat—even a few times a week—can have a host of health benefits, including improved blood pressure, decreased risk of heart disease, lowered cholesterol, and better weight control. Just replacing meat with starchy refined carbs, cream, and cheese may be “eating vegetarian”—but it’s not eating healthfully. EatingWell shows you how to plan a well-balanced vegetarian diet full of whole grains, fruits and vegetables, and lean sources of protein like tofu, beans, and eggs. Plus you’ll find out why eating less meat is lighter on the environment and your budget. This cookbook solves the problem of how to make a healthy vegetarian meal everyone in the family—from steak-lovers to dieters—will love. For nearly 20 years, every issue of EatingWell Magazin e, whose motto is “Where Good Taste Meets Good Health,” has featured healthy, satisfying, meatless meals, such as Zesty Wheat Berry–Black Bean Chili, Mediterranean Baked Penne, and Tomato-Corn Pie. 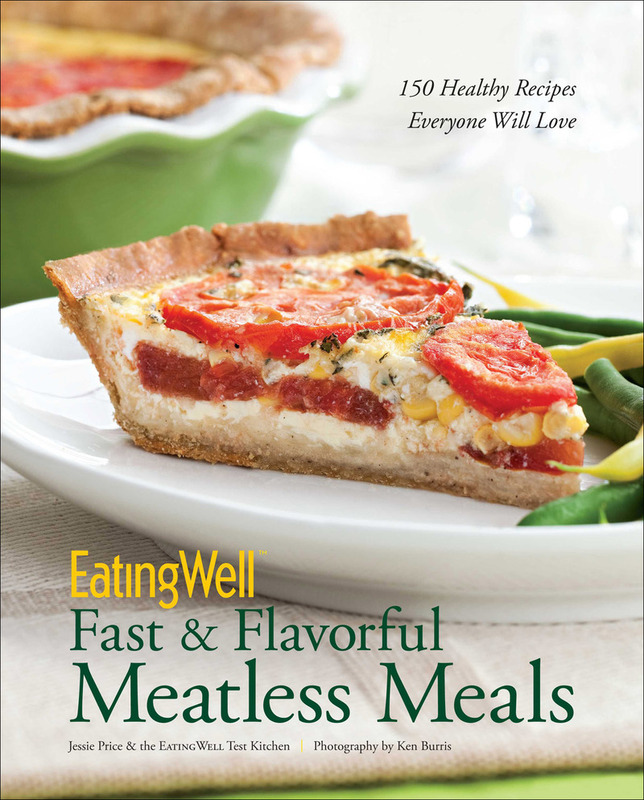 The best of those recipes can now be found in one place: EatingWell Fast&Flavorful Meatless Meals . This cookbook dishes up 150 recipes for soups and stews, salads, sandwiches, pasta, and pizza. ere are special tarts, gratins, and other impressive dishes for entertaining—and plenty of delicious appetizers, wonderful side dishes, and divine desserts to round out all your menus. And like all the recipes from award-winning EatingWell Magazine , the healthy recipes in this book really work. Most can be prepared in less than 45 minutes and use simple, easy-to-find ingredients. And they have all been tested multiple times by the expert cooks in the EatingWell Test Kitchen. With recipes like these, you’ll never miss the meat.